Contact: Troy Wade, Chairman, Louisa County Board of Supervisors. 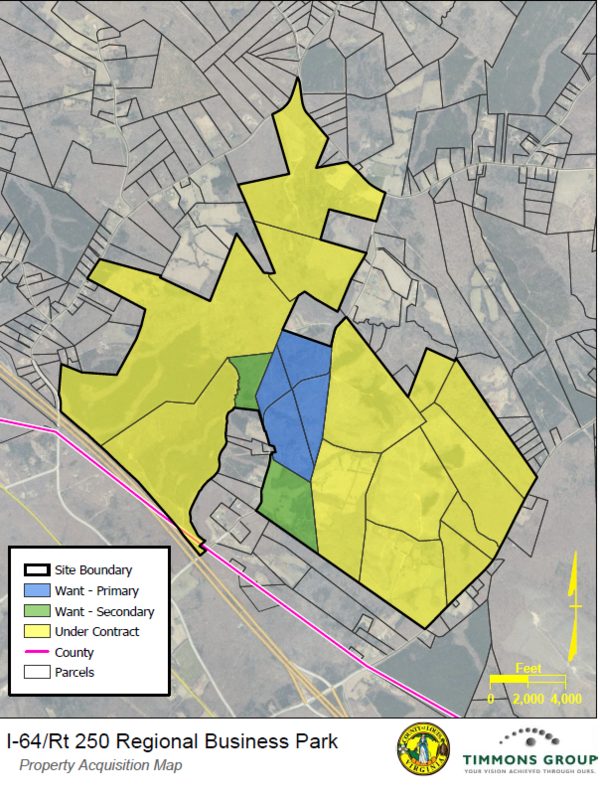 LOUISA COUNTY LEADS EFFORTS FOR THE DEVELOPMENT OF A REGIONAL BUSINESS PARKLOUISA, VIRGINIA – The Louisa County Board of Supervisors is pleased to announce proposed development plans for a regional business park in the County’s Mineral District. The park, which is still in the planning stages, could potentially encompass roughly 1,650 acres near the Shannon Hill exit off Interstate 64. The County evaluated several land options in the Shannon Hill area for the development of the park. To date, planning efforts have included the option contracts to purchase several parcels from multiple owners, preliminary site due diligence and a fiscal and economic impact analysis. The Virginia Economic Development Partnership (VEDP) has cited a statewide lack of “shovel-ready” large sites as a major limiting factor in the state’s ability to compete for businesses that require sites greater than 100 acres. Access to the park would be strategically located off Interstate 64 and route 605 to minimize traffic impacts and facilitate efficient interstate access. “Access to an interstate or four lane highway is a critical criterion for site selection consultants and new businesses performing initial site due diligence analysis. This site checks the box at less than one mile from Interstate 64,” said Andy Wade, Louisa County Economic Development Director. 1. What has the County committed to do? a. The County has obtained options to purchase land (if desired) for the purpose of developing a regional business park in the Shannon Hill area of the County. The map below depicts park parcels, which are loosely bordered to the south by Interstate 64 and to the east by Route 605. 2. What types of businesses are targeted for the park? 3. Some of these businesses look industrial. Won’t they generate noise, light and traffic? a. Unplanned industrial growth may have these (or other) impacts. However, if the park is developed, the County intends to utilize stringent guidelines to minimize impacts. These include access points as close to the interstate as possible, careful buffering, and light/sound controls. Other agency reviews will address air quality, stormwater and wetlands mitigation, and related concerns. a. Interstate interchanges are critical to economic growth, and the park’s location is ideal from this standpoint. Managed, responsible growth in these types of areas retains the rural character of the rest of the County. Also, available utilities are essential to economic growth. The County’s water / sewer lines would require minimal extension from Ferncliff, fiber is already along Route 250, and natural gas is available within the proposed site. Finally, the site is strategically located from a standpoint of workforce availability. 5. Why industrial rather than commercial? What’s the difference? a. Both can be good, but commercial growth often comes at the expense of increased residential growth – for example, a big-box store will typically only develop when there is enough residential growth to support it, and may drive more residential growth which is expensive in its own right. Growth of industry typically creates jobs (for existing citizens and those who might commute in) with less impact on residential growth. a. In state economic development terms, a “megasite” is simply a name for available land greater than 1,000 acres. The lack of available larger sites in the state is repeatedly cited as the reason for missing out on projects that have landed in other states. As a result, the state is supporting (and incentivizing) larger site development and availability. 7. Why is the County so focused on economic growth rather than residential growth? a. The County’s population has nearly doubled in the last few decades. This trend, coupled with currently available land in the County, indicates that residential growth may continue regardless of economic growth. Economic growth is critical to ensuring that there are sufficient jobs and adequate revenue to meet the service requirements of a growing population. 8. How much acreage is involved? a. 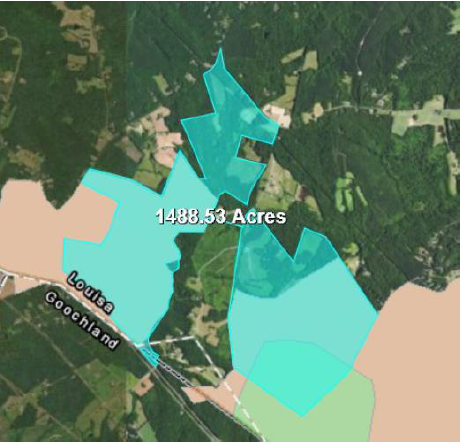 The County currently has options to purchase nearly 1,500 acres and the Board may elect to acquire as much as 1,650. 9. Was eminent domain necessary? a. No. All parties agreeing to the purchase options have done so voluntarily. 10. Have costs and benefits been calculated? a. Should it go forward, the initial land acquisition cost is approximately $6.5M. Total site investment (acquisition, utility modification, roads, etc.) will add significant further costs over a 25 year period. However, associated revenue from the site at full buildout could exceed $15M per year. This allows the County to maintain its current low tax structure. 11. Is the County paying the entire cost? a. The County is applying for the state’s GO Virginia regional economic growth funds (more info on GO Virginia and our region is here) to offset the cost, and is also actively soliciting regional participation from other localities and investors. These future partners may be part of a revenue sharing agreement where they derive partial future site revenues in accordance with their initial investment. b. The County is also evaluating the Virginia Jobs Collaborative Act. This program returns a portion of the net new state income tax to the locality when a minimum of 200 jobs are created and wages paid average more than the average in the county. 12. Does the park comply with the Comprehensive Plan? a. Certain northern portions are outside the growth area, but pending further consideration and/or public input, zoning controls may be used to safeguard those areas. The map below shows further detail – park parcels are in blue, and those in the growth area are more opaque blue. 13. What’s the timeline for development? a. Due diligence (to assess whether or not the site would meet development requirements) would take several months at minimum. The property will also need to be rezoned if purchased. Two phases of development are contemplated over a period of 25 years. This may occur sooner depending on interest. a. Engineering, environmental impact assessments, permitting requirements, and related evaluations to ensure that the site is suitable for the contemplated project. 15. Who performed the financial impact analysis for the park? a. The County retained Mangum Economics, an experienced economic forecasting firm, to analyze fiscal and economic impacts. 16. This information is helpful, but why has this process not been more public to date? a. The County has legally and privately negotiated with property owners, many of whom live outside the County, under non-disclosure agreements and through a third party. This process is necessary to ensure the County’s negotiating power. If the process were publicized, the associated taxpayer cost could have been significantly higher. 17. Will there be opportunities for public input? a. Yes – first during the planning and due diligence process. If the County does decide to move forward with the purchases, rezoning will be necessary, and this process includes several additional opportunities for public input.